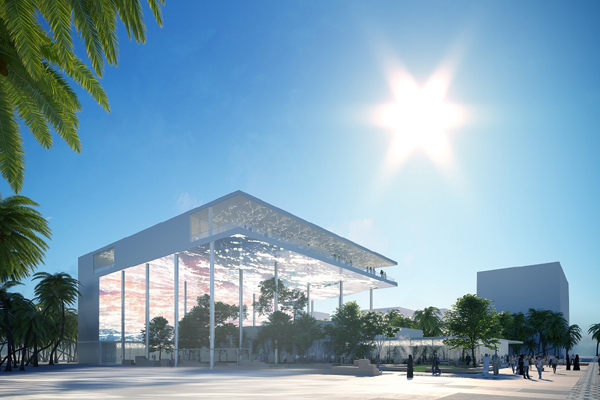 French authorities have unveiled the architectural model of the country's pavilion for the Expo 2020 gala event which will run from October 20 next year to April 10 2021 in Dubai under the theme "Connecting minds, Creating the future". The pavilion has beeen designed by the Atelier du Prado Architectes and Celnikier & Grabli with 'Light' as one of the key inspirations. It was thought as an oasis from which a true canopy of light literally emerges. The French Pavilion will express, through its name "Light, Lights", France's singular and innovative vision in terms of ecological and inclusive transition, combining a strong architectural gesture with an innovative immersive scenography. Brune Poirson, Secretary of State to François de Rugy, Minister of State, Minister for the Ecological and Inclusive Transition, unveiled the French Pavilion at a gathering in Dubai. It will be both a symbol of France’s participation in this world event an emblem of the promotion of French innovation and an experiential space for all visitors, said the top official. "The Expo 2020 Dubai will be a major opportunity to demonstrate that our choices in favour of ecological and inclusive transition are conducive to solutions, meaning and growth," remarked Brune Poirson. "Solutions to make daily life respectful of the planet and citizens. Meaningful and growing also for our companies, both public and private, whose innovations will delight future visitors to our Pavilion," he stated. In the heart of a site of nearly 4.5 sq km south of Dubai, the "Light, Lights" pavilion will be located in the area dedicated to Mobility, the other two themes being respectively dedicated to Sustainability and Opportunity. The French Pavilion aims to not only highlight the fastest possible mobility, but also to embody the Enlightenment, a symbol since the 18th century of sharing and spreading knowledge. It will promote the French innovation model, which makes it possible to conciliate sustainable development and international business competitiveness for connected and sustainable cities and territories, serving the citizen and the common good. A facility that goes beyond the limits of a regular building since it fuses materials and light in a single structure to showcase the content of permanent and temporary exhibitions. A powerful idea lies at the heart of the project: to begin the visitor's journey outside the structure and continue the experience seamlessly inside, transforming waiting time into a moment of sharing and emotion – a concert of sensations that encourages reverie. Inside, the permanent exhibition - over 800 sq m - will showcase the assets of the French-style city in an organic scenography that combines sound, light, perfume and materials. Designed by the "Immersive(s)" group, of which the Snaik agency is a member, with Jean Marie Priol as artistic director, this 'city' is conceived as a striking immersive and pedagogical experience. "An opportunity to promote an urban model driven by French actors, to support the development of our companies in emerging countries in Asia, the Middle East and Africa, promotion of the economic and tourist attractiveness of the French territory, Expo 2020 Dubai must enable France to defend its vision of sustainable cities and connected territories", explains Erik Linquier, general commissioner of the French Pavilion and president of the Compagnie Française des Expositions (Cofrex), a company in charge since January 2018 of organising French participation in international exhibitions. In line with France's ecological ambition, notably through the One Planet Summit, this pavilion will be the most sustainable ever built because it can be dismantled and reused, he stated. Thought and designed as virtuous, it will be deployed according to the three pillars of bio-climatism: renewable, clean and controlled energy, sustainable materials and a circular economy at work, said Linquier. "Connecting Minds, Creating the Future, the theme of Expo 2020 Dubai is a strong and differentiating point of the French offer. Through its participation, France intends to make the mobility of people, goods, territories, ideas and information a fundamental issue in solving the challenges of transitions, whether technological, ecological or economic,." he explained.